I thought I’d share a few unique images taken by yours truly, along with Gralien Report correspondent Christopher McCollum and videographer Brian Irish during an October 2009 television shoot with the National Geographic network. The purpose of our visit was to try and document evidence of the mysterious Brown Mountain lights, a strange “ghost light” phenomenon that occurs throughout the Linville Gorge Wilderness near Morganton, North Carolina. 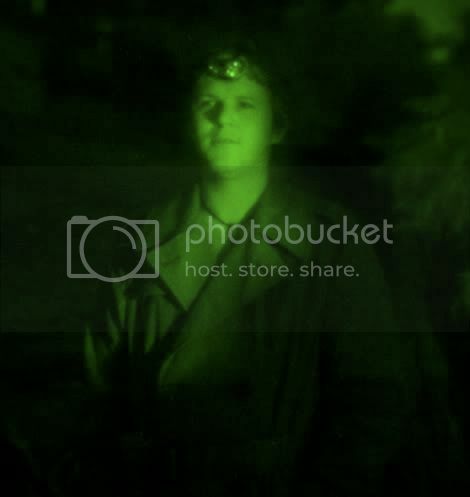 In the image at right, you can see what I looked like when viewed through night vision equipment we were using, which casts a creepy, “Gralien Glow” on those viewed at close range. Situated just outside of the quaint little township of Linville Falls, Irish, McCollum and I were performing a stakeout within a large stone turret-like structure, one of two that lines the cliffs at Wiseman’s View. From this vantage point adjacent to Table Rock (the large outcropping visible in the photo at left), we were able to use state of the art night vision equipment on-loan for the shoot to observe potential airborne anomalies after dark. Although a few strange things were seen (including the small airborne illumination, left, photographed above the furthest right extremity of Table Rock in the image), there were no significant illuminations filmed or photographed by those in my immediate company. Brown Mountain is a long, low-lying ridge on the border of Burke and Caldwell counties in Western North Carolina. Most of it belongs to the Pisgah National Forest. For perhaps 800 years or more, ghostly lights have been seen flaring and creeping along, and below, the ridge at night. Some of the earliest reports came from Cherokee and Catawba Indians, settlers, and Civil War soldiers. Thousands have witnessed the spectacle, which is ongoing to this day. The lights have been investigated three times by the United States government, and countless times by private groups. The eerie illuminations capture the imagination of those who see them, and were even featured in a 1999 episode of The X-Files. 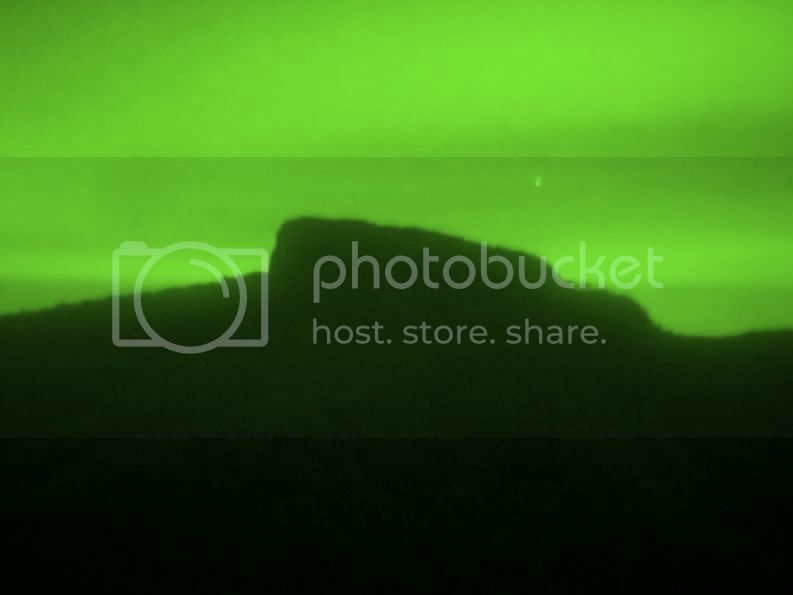 IMAGES: Above, right: Christopher McCollum looks out over the Linville Gorge in search of luminous anomalies. 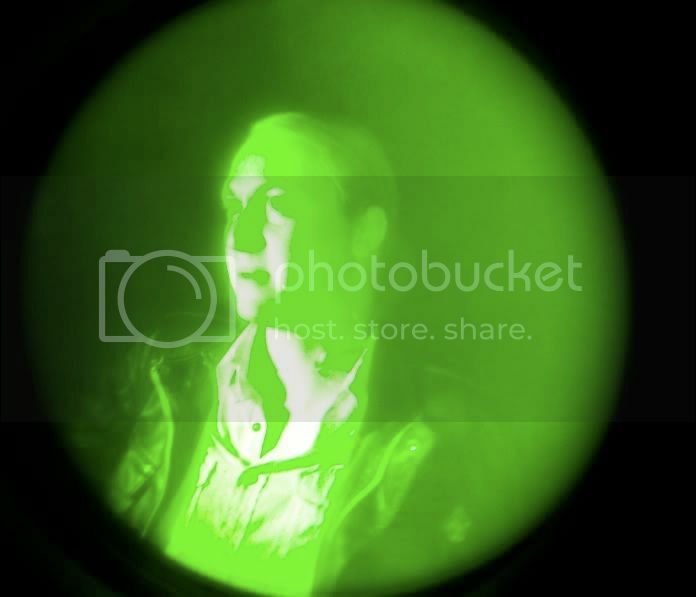 Right: Brian Irish uses his night vision camera to film the ridge. In November of 2000, Irish was first to videotape what are believed to be the Brown Mountain Lights using this technique.